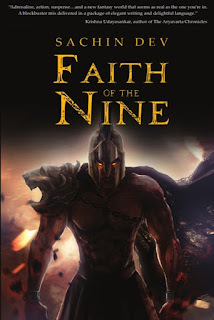 Faith of the Nine by Sachin Dev: Promo! That is obviously an anthromorphic personification of time – but that is the scene I had in mind when I thought of the name of my series, Wheels of Janani. A ginormous wheel of time rolling along unstoppably towards the end of a world. Indian mythology has this concept of the Trimurti – or a triumvirate of power. Focused on Three Gods who are entrusted with the cosmic functions of “creation”, “sustenance” and “destruction”. Brahma, Vishnu and Siva. And Vaishnavism claims that this yuga or epoch known as the Kali Yuga will end with the appearance of Kalki, the tenth avatar of Lord Vishnu – the world ending in an apocalypse leading away to the next yuga. The world Janani is rolling on towards the end of its third yuga – and the Wheels of Janani or time portends an impending apocalypse that would destroy this world. A child of the Ancient Nine (an avatar – that is the descent of the divine to the material realm) is prophesied to be born into such a world on the brink of its destruction. While the over-arching theme is borrowed from the same concept as the end of Kali Yuga, I put a spin to this situation. What if the prophecy is unclear? The avatar’s appearance in the world can either plunge the world into ashes and blood and destruction or save the catastrophe. And what is the cost of ‘saving’ the world? At the heart of the conflict of my series is religion. And digging a bit deeper, it’s emotional failings. Emotions for which we have no control over getting the better of reason and causing irrational behaviour leading to disastrous consequences. 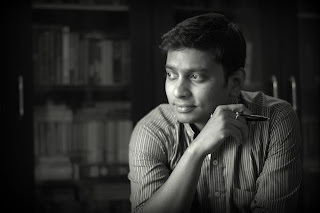 So I set out to write about a thriving flourishing empire set in this world – built on a sequence of lies and deceit ruled by a set of high priests directly in communion with their God. A set of tyrannical paranoid rulers who would exterminate anyone not willing to believe their faith. Or practice Maaya (Magic!) born of the older tenets of faith. Into this setting I slowly wanted to build the picture of a set of survivors who doggedly stick to older beliefs waiting for the arrival of the “prophesied” child who can save them. And the world. A set of unbelievers who start to question their faith and loyalty – and slowly discover a hidden set of reality. Cue the bugles of war. As we hurtle towards the end of this world, will the child of the Nine save Janani or speed up the prophecies of doom? Lover's Surrender by J.C. Reed: Promo! Wasted Time: Promo and Giveaway! List To Me by Kristen Proby: Cover Reveal! Charmed by Jen Calonita: Promo and Giveaway! Laguna Lights by Kaira Rouda: Promo! Consent by Nancy Ohlin: Review and Guest Post! When Our Worlds Collide by Aniesha Brahma: Promo! Dystopian Authors Collide: Promo and Giveaway! The 50 States Blog Promo: Illinois! Christmas Kisses: Promo and Giveaway! Leveled by Jay Crownover: Promo and Giveaway! Avon Social Media Events and Sales! Timesurfers by Rhonda Sermon: Promo and Giveaway!